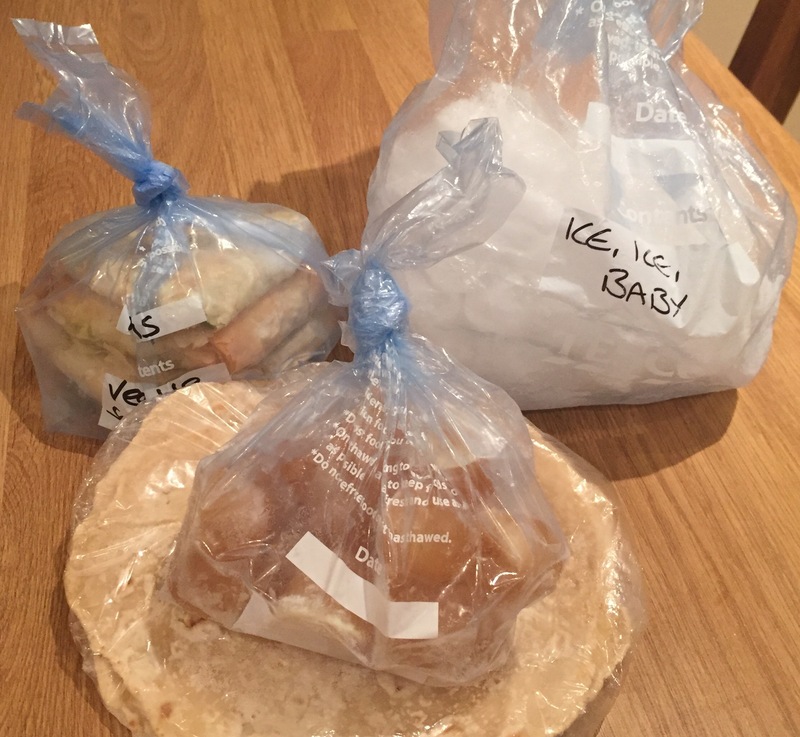 With the recent spell of bad weather, which could well be the first of many as we tread steadily on into the deepest darkest depths of winter, I thought it would be a good time to share my tips as to how I run my freezer. Not just because it’s almost as cold out there as it is in the freezer drawer, but because it’s a really good time to make sure you have lots of good food in stock which could potentially make you a meal if you can’t make it out to the shops (or in case the shops run out again!). 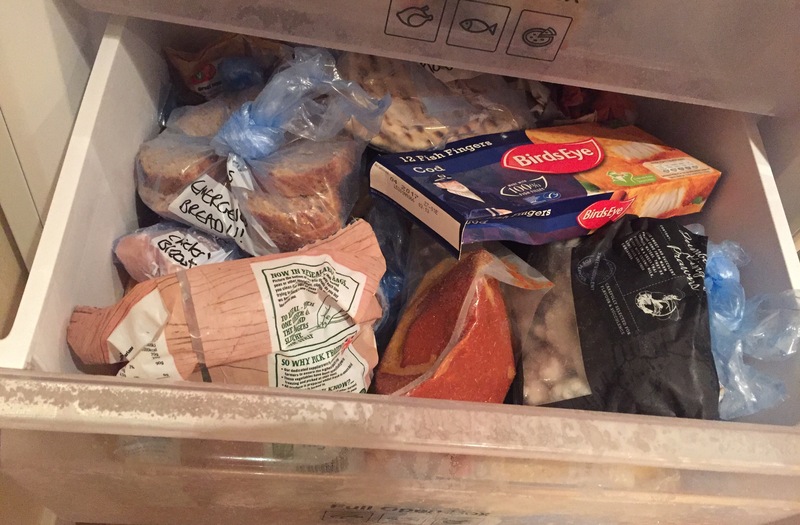 Ok, it isn’t the tidiest freezer just now, but there is plenty in it, although I am trying to run things down a little to replenish with fresher food. It’s important to me to have a good-sized freezer because I cook a lot, pretty much every day in life. And to cook economically in a household of one, batch cooking is essential. And unless you want to be eating the same stew all week, you have to learn to freeze your leftovers. It’s genius really. Not only do you prevent waste, but you give yourself “ready meals” for those days when you don’t have the time or inclination to throw something together from scratch, but when you still feel you need something balanced, nutritious and homemade. 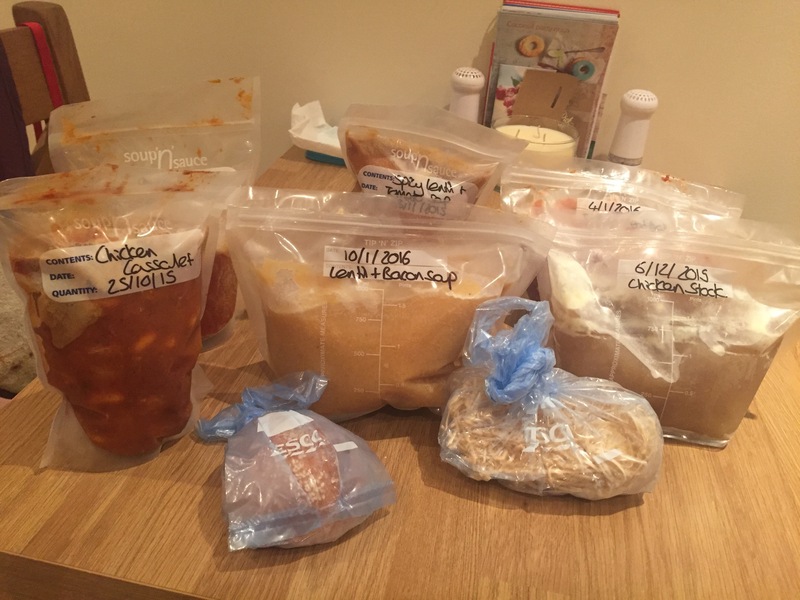 In case you’re interested, I thought I’d share some of the things I have in my freezer most of the time which help me to keep things ticking over. Because this is my shallowest drawer, as well as the easiest to access, it’s where I like to make and keep ice. It’s not totally essential at this time of year, but it’s good to have. Because I have a frost-free freezer, however, the ice in the trays is constantly being eroded, so I like to make it then decant it into a big freezer bag to try to keep it intact. Ice cube trays are also really useful for preserving all sort of things, such as fresh herbs, and I used one to freeze some homemade chicken stock into little portions which can be added to sauces to lift their flavour a little. Pictured here I also have a couple of frozen homemade tortilla wraps, as well as three homemade vegetable samosas, which are too delicate to risk being thrown about when I’m rummaging around in the major drawers. The top drawer is also home to my ice cream collection. 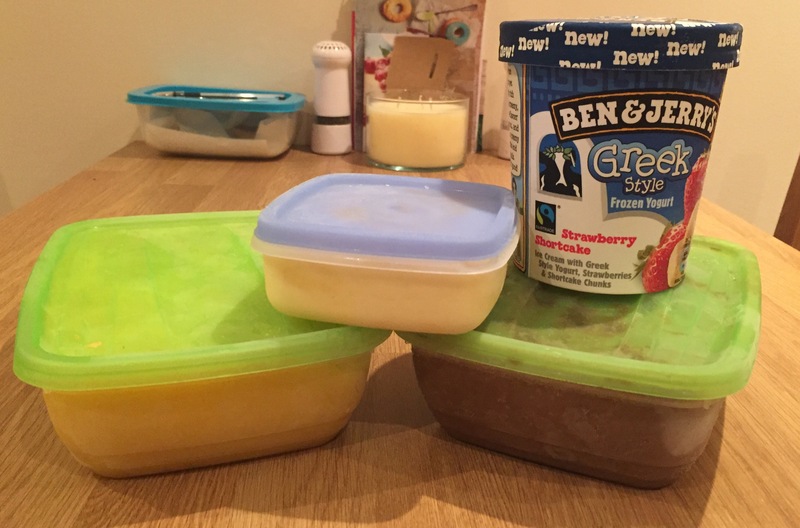 I have an open tub of Ben & Jerry’s Frozen Yoghurt hanging around from when I first tried to lose weight (which I may have given up on as a result of how bad this was) and I’m keeping it around for emergencies. This is where things get serious. We’re in the belly of the beast here where there’s most space, but it can get to be a bit of a mystery what’s in here! First, we have the vegetables. You have to be careful with some vegetables if you decide to freeze them from fresh; carrots, for example, are prone to losing structural integrity when frozen in a domestic freezer (frozen food producers have industrial rapid-freeze units to combat this problem) but others work really well. Leftover green beans are great to freeze to avoid them going bad, and are so quick to defrost and cook (cook from frozen) but I always forget to top and tail them before I put them in the freezer!). Peppers work really well as well if you have a glut (my dad grows them in his greenhouse) – just slice them, bag them and put them in the freezer and you can then use them in stir fries or fajitas when you forget to buy fresh. I always have frozen peas in my freezer as they are so quick to provide a nutritious and tasty portion of veg, as well as being great to bulk out a pasta sauce or rice dish. Although I haven’t yet needed to use them to soothe someone who has been punched in the face! Next up we have various frozen bread items. The problem with fresh and homemade bread is that it goes stale within about 24 hours. So when I make fresh bread, I like to slice and immediately freeze anything that’s not going to be used. You can then pull it from the freezer and put it straight into the toaster. I have a couple of old frozen loaf heels as well which can be defrosted and blitzed into breadcrumbs. 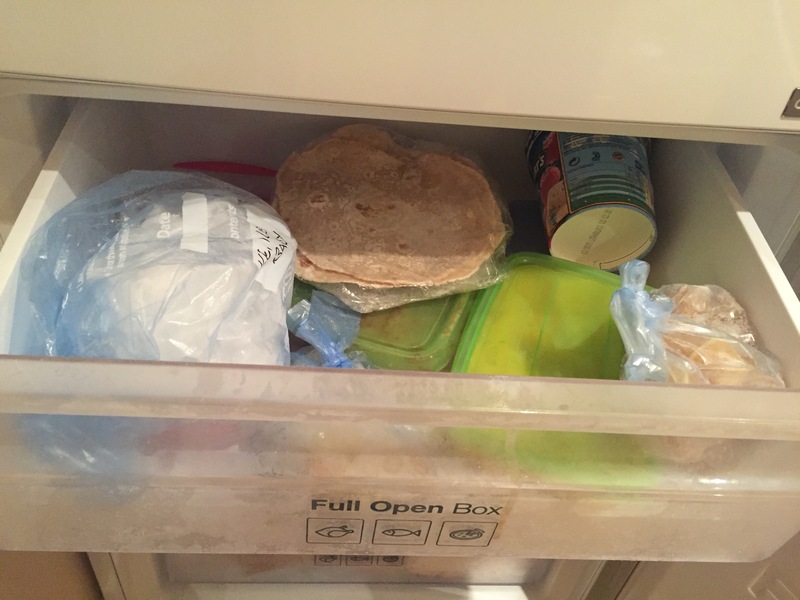 I like trying out different types of breads as well, so I often have a couple of homemade naan breads chilling out in this drawer, but just now I have a couple of flatbreads, which can go straight into the oven to defrost and warm through when needed. Given I live on my own still, I like to batch cook and freeze leftovers, like curry or pasta sauces and homemade burgers (which taste best if you freeze them uncooked). Ready meals in a flash! The big guy in the front is half a batch of cookie dough which can be defrosted, sliced and baked off when needed. 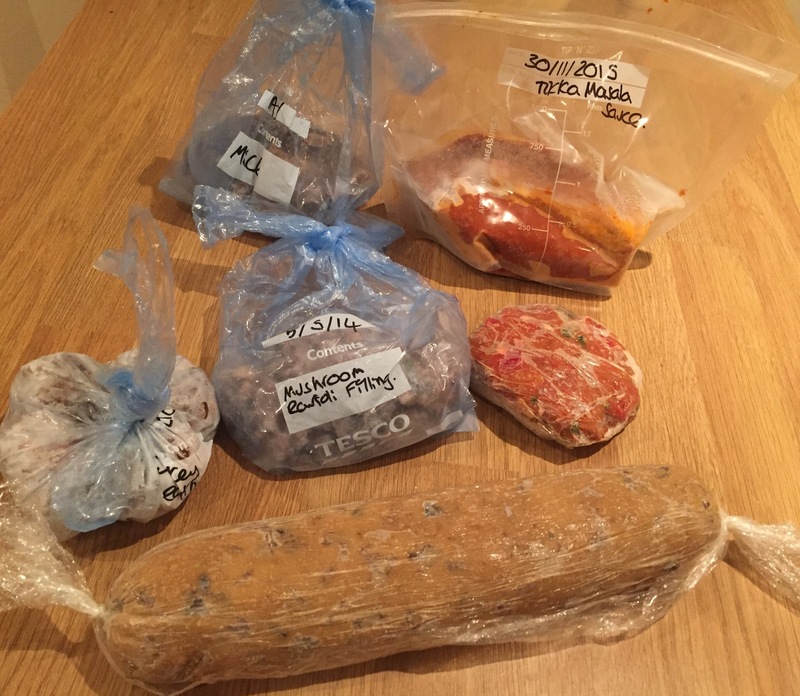 Along the same lines, I like to keep some frozen raw ingredients in the freezer for later in the week when I haven’t made it to a supermarket, and it’s also an economical way of making sure one person can use up a packet of 8 sausages! 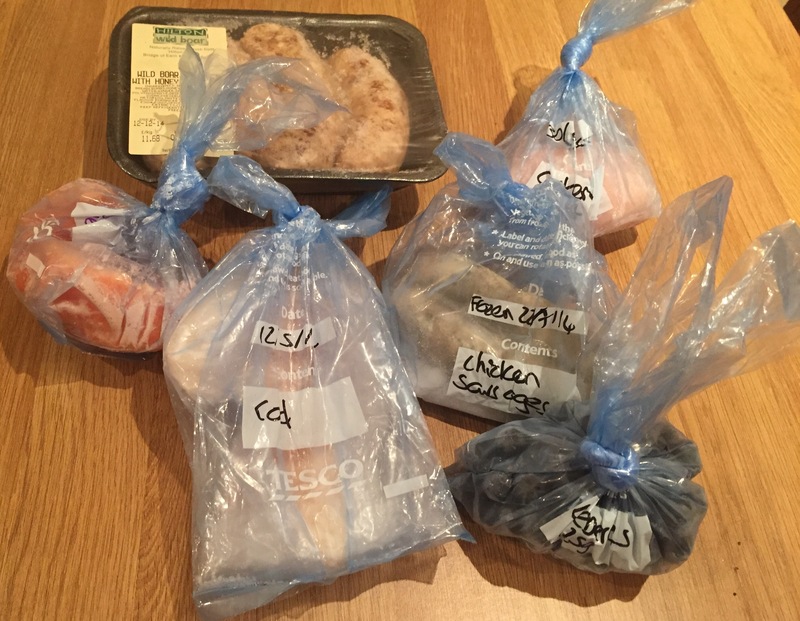 The usual suspects are salmon fillets, chicken breasts and sausages, but I also have a cod fillet and some blueberries just now. Freezer bags and a Sharpie are a must! This is where I have to admit to resorting to “convenience foods” every now and then! I have a couple of ice lollies for when it’s warm outside, as well as some cheeky breaded mushrooms and potato wedges (because sometimes you just have to!). Fish fingers are another must have, because they can easily be cooked off from frozen and served up with peas. Not the most heathy choice but everything in moderation (and I fear I’ll have to give up when I move in with Charles due to his fish allergy….). 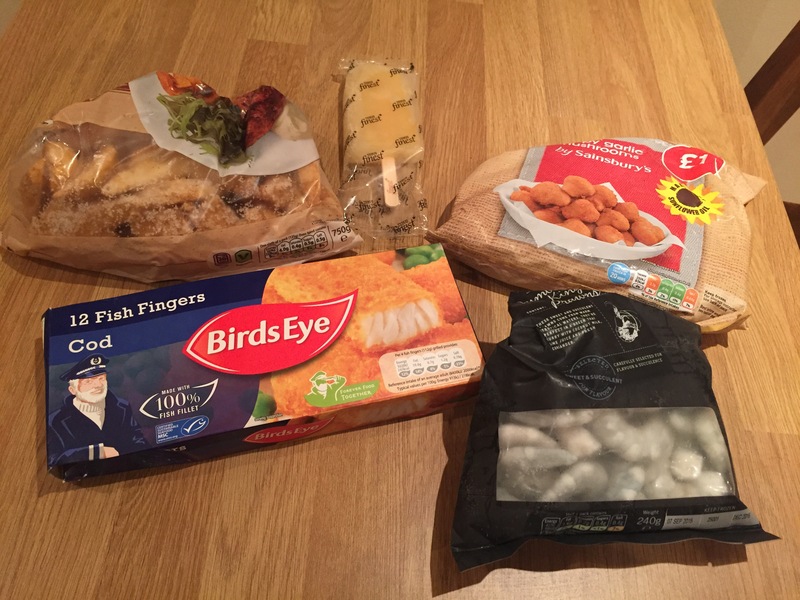 The winner in this category is these Tesco frozen King Prawns. They’re usually about £5 for a bag (although I got these for about £3.50 I think) which is much more economical than the fresh ones. They’re nice and big and defrost relatively quickly in a bowl of cold water so they’re great for a last minute dish if you forget to take something out of the freezer in the morning. Just remember to remove the gut! This is the drawer which has the most turnover, because it’s where I keep my frozen soup and more liquidy leftovers such as meatballs in sauce and casseroles. I love having soup for weekday at my desk lunches, so I usually make a big pot of it every Sunday, with leftovers going in the freezer for weeks when I don’t have time on the Sunday. It also makes a great last-minute starter or lunch if someone decides to visit. The Lakeland Soup and Sauce bags are great for freezing this type of thing as they sit nice and upright to be filled, but it does mean they need a deep freezer drawer until they’re nice and solid. 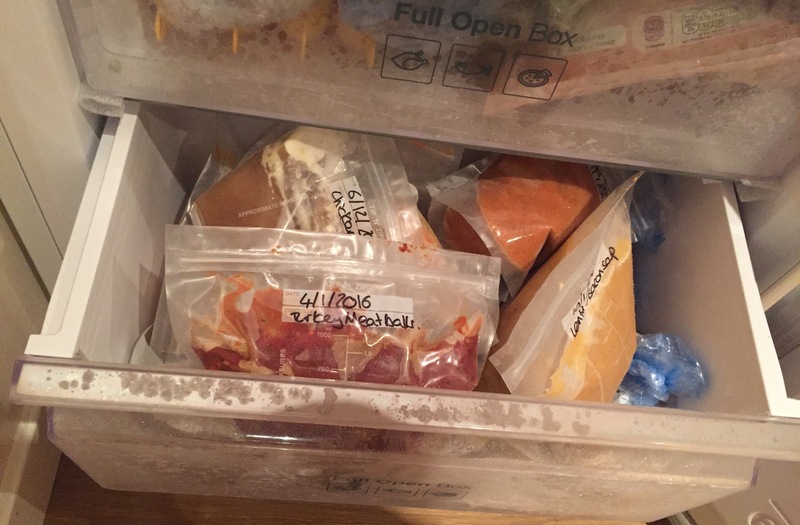 More recently, I’ve been using these Tip N Zip bags my Mum found at Home Bargains – they’re much cheaper and sit more horizontally so they’re easier to squeeze into the freezer. This drawer also houses some random odds and sods like homemade linguine and a brioche roll, as well as some more bread. Sorry this post went on for days, but I hope it was helpful or interesting. I’d love to hear what you always keep in your freezer.